Over the last few years, Americans have been downsizing their household budgets, saving money wherever they can. One low-hanging target for penny pinching is the grocery store checkout counter—if you only have $50 to spend on food for the week, you probably won’t be picking up the $7.99/pound ground round at Whole Foods. Or maybe you will if really like Texas-style chili. Given the generally sorry state of disposable income, you would expect natural and organic foods to be struggling somewhat. You would, however, be wrong. These very foods have seen strong growth. Last year, overall grocery industry sales were up a modest 1.8 percent, according to the institute. Sales of organic items were up 4.4 percent in the 52 weeks ending Feb. 20, according to Symphony IRI in Chicago. (A) – People who tend to buy natural and organic foods have not been significantly impacted by the recession. 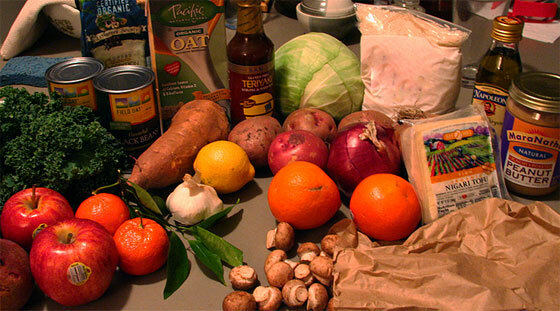 (B) – There are more organic and natural food products available in stores, hence more purchases. (C) – Customers are willing to spend more money on foods they perceive to be healthier. The answer is probably some combination of the above. Kurt Jetta, president of a Connecticut consumer research firm, says that the proportion of shoppers buying natural and organic has held steady. Jetta seems a bit down on the long-term growth of natural and organic products on retail shelves. His view is logical, since natural and organic labels have already begun losing their luster in the mainstream. Fads, generally speaking, don’t see sustained growth. But are we really looking at a fad? There are plenty of signs, at least in American food culture, that people really do want to know what is in their food and where it comes from, particularly when that information has a powerful impact on the health of our communities and ourselves. The end game is transparency, and though we may never get there, it is certainly the direction we are headed.